Mondrian! The pattern is finally ready to go. Erie Quilt Art is my wholesale distributor. Your LQS can source my patterns there. Or contact me directly (email contact is on the right side lower down). 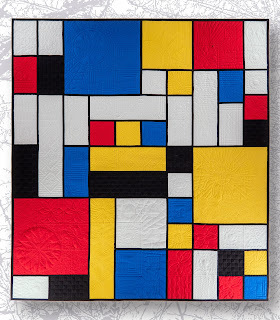 Unlike the first Mondrian quilt, there are no partial seams in this one. It consists of 10 large blocks. They are all different, but since they consist of large squares and rectangles separated by narrow sashing, they are all relatively easy to assemble. There is a "support" page for this quilt. Look for the Mondrian tab. There are some sewing tips and quilting ideas along with some pix to illustrate how I did the quilting. Close up pix of the quilting are below. The black didn't show up much in the other pix so I snapped this one in the sunshine. Now you can see what I did in all the black - 1" grid with every other square filled in. 1 - square or rectangle of fabric (I used 8" x 8" because I had some pre-cuts that size - from IKEA!) You can make yours bigger. Step 1 - Cut a 1 1/2" strip off the top of the big fabric piece (above). Step 2 - Stitch the zipper to the two pieces as shown above. Be sure to line the fabric up so the print matches and the sides line up. Press. Step 4 - Press up 1/4" on each end. On the bottom end (biggest side) press up another 1/2" (above). Here is where you can cut your vinyl. It should fit between that bottom folded edge and about an inch below were the zipper is laying in that pix above. If in doubt, cut it the width between the zipper tape and the first fold on the bottom piece - you'll be trimming it later anyway. Step 6 - Fold the zipper over as shown above. It has a "natural fold" along the edge of the zipper tape, which is inside the fold - about 1/4" into the black and white fabric. Top stitch the crease along the top edge. Step 7 - Now you will have a better idea of where to trim the vinyl. The bottom edge should lie just above that second fold. Step 8 - Fold the bottom over the vinyl. It should all lay nice a flat at this stage. Step 10 - Press the two strips in half, then press each half to the centre as above. Step 13 - Stitch the second strip to the remaining side as you did the first side. Et Voila! One finished wallet! I have a roll of vinyl of a few feet (you can purchase it by the linear foot) that I purchased from someplace like Canadian Tire. However, if you're just doing a one off you can use one of those vinyl bags that blankets/ duvets, etc. come in. If you have trouble sewing vinyl with your machine, try your walking foot or maybe some masking tape along the edge to make it a bit "grabbier" - I didn't have any trouble with my Juki and I've also used my Janome with no problem. Some of the IKEA squares were white so I got out my fabric markers and started playing. 😀 I used the one on the right to carry my foreign currency when we were in New Zealand - it worked out really well.